I really did mean to post over a week ago, but technical issues got in the way. I know it sounds like the modern version of "the dog ate my homework", but I really did have tech problems! I sat down to download the required pictures and couldn't find the necessary cable. The likely culprit in the disappearance was not home, then I forgot multiple times to interrogate the likely culprit when he was home. I finally remembered to ask if he had seen it, he returned it, and the internet promptly went down. By the time that was resolved, I was busy in the garden trying to divide plants before the heat hit, then baking for the culprit's high school graduation party coming up this Saturday. So now, without further babbling, here's what I said I would post over a week ago. I have struggled with this quilt and I am still not sure I got it right. A customer came in to the shop where I work with a pretty quilt that used these soft bird panels and the floral. On impulse decided to make one too. I bought the same fabrics and rushed to start...and couldn't remember the details. That's OK, I thought I'd just use the general idea as a starting point and run with it. I don't mind this picture at all, but I hated it on my wall in real life. The floral wasn't popping as much as imagined, and the whole thing looked very dense and busy. How about more floral in the borders? I rather liked this, so I went ahead and finished piecing the center of the quilt. Then I looked at it and felt it looked too much like a checkerboard of birds. 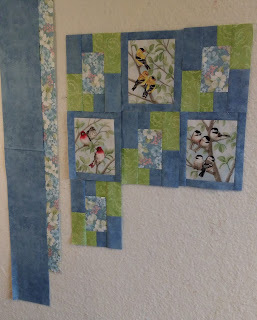 I also couldn't decide what fabric I should use for an inner border before the floral. Looking at this picture now, I think I could have just used the floral as the inner border. However, I didn't see that then, and I decided to extend the diagonal lines of green rectangles into the border to distract from the checkerboard effect. This still looked very busy to me and adding a floral border just added to the crowded look so the floral border had to go. In the end I just added a wide blue border to float the whole center on a blue background. Now I need to decide how to quilt and bind it. I still want more floral, so maybe I'll use it for the binding. As for the quilting...I know what I don't want better than I know what I do want! 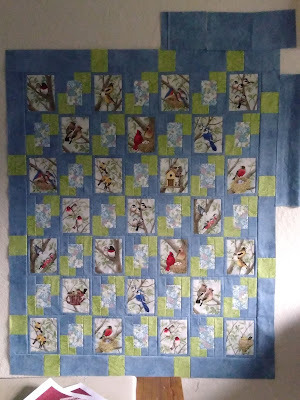 I do not want to trace those birds in free-motion quilting! An all-over loose swirl design might look good, but I'm going to have to overcome a mental block about quiting willy-nilly over those birds! Also, I think I still want the borders to be distinct from the center somehow, while still floating the center. My mind's eye really doesn't ask for much! Sometime this week I will baste this and hope I have a plan by then. Tonight, I'm going to step away from this one and play with sunflower fabric. The kitchen table needs new placemats! I think this turned out very pretty. And I am grateful that things finally fell into place so that you could share it with us! Well, I think it's so pretty that whatever you decide to do will be perfect! I love the softness of the floral fabric. It really allows the birds to be the focus. The bird panels are gorgeous! It's going to be a beauty. Happy Graduation! What a pretty quilt! I agree that whatever you decide to do will be perfect. Enjoy the graduation, too. 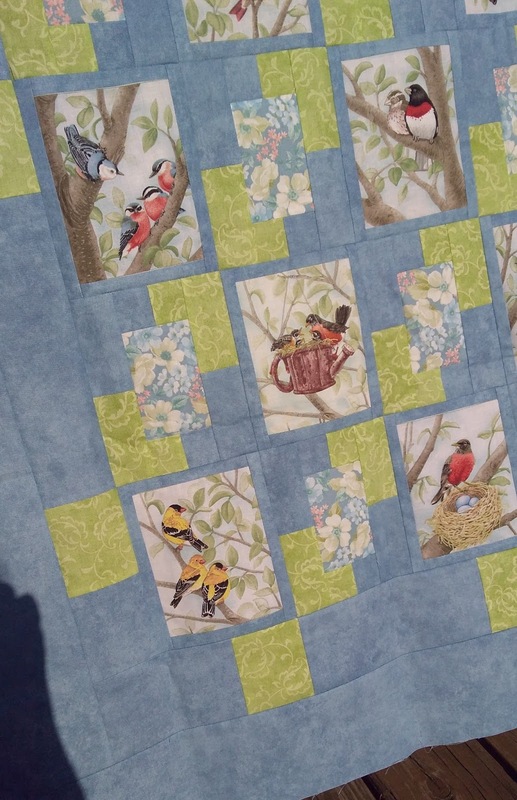 What a lovely quilt with such a soft and spring time gentleness to it. The challenging aspects will soon be forgotten once you have it finished and you can truly enjoy and admire it! 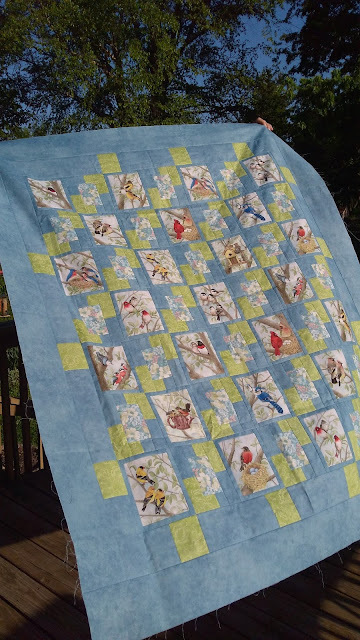 I am like you, and would not want to FMQ over the birds, nor would I want to outline them. 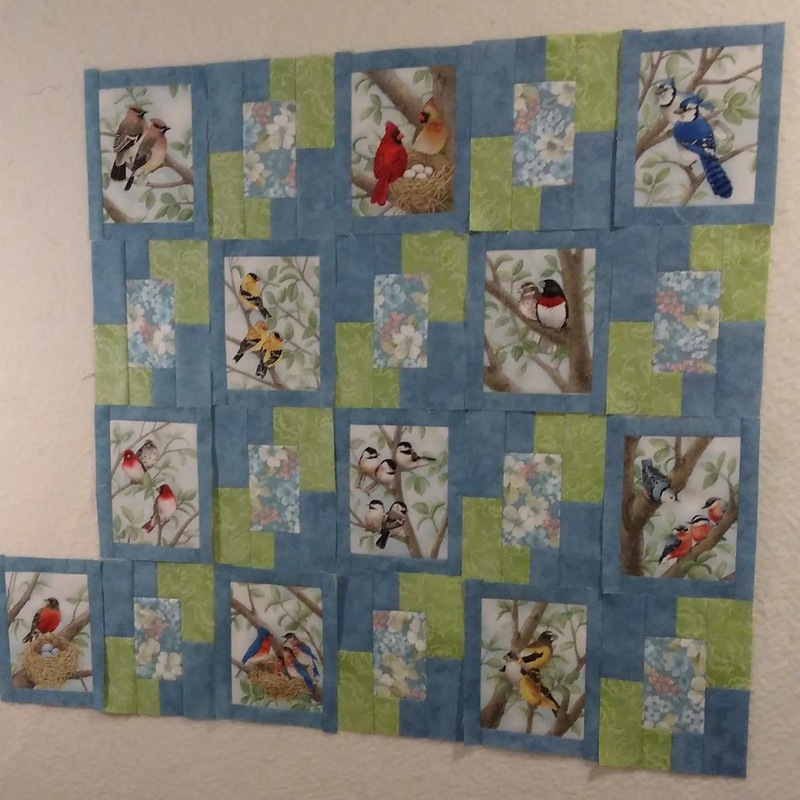 I have used a random meandering vine and leaf FMQ design which could work, as you could wind the fine around the birds with leaves here and there of assorted sizes. Then what about a bark effect for the borders? Congratulations to the Culprit:) on his High School graduation! I'm sure a proud Mom you are and will have a special quilt for him to mark the occasion. I absolutely love those birds! And the florals! Both are beautiful! Your setting is perfect also. I understand your not wanting to free motion through the birds; outlining each bird would be a big undertaking, but wouldn't it be "loverly", as the old song says! There's lots of "beauty" in those prints; there's no way you could lose it no matter how you choose to quilt it! ---"Love"
It looks so soft and very pretty! Taking a step away and coming back later may be just the thing to decide on quilting. It looks so lovely! I really like the effect of the pieces floating in the blue background. It's like seeing the sky beyond the tree branches. 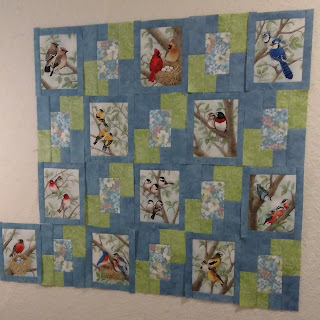 I think overall quilting with a nice neutral thread will "disappear" into just texture, and leave the pretty birds and floral to shine! Borders drive me to distraction but I think you have this one sorted. Those bird panels are delightful. Seems both you and Love have experienced pc gremlins. I'm looking forward to seeing what you decided on for the quilting pattern. What fabric panels and other fabrics did you use in this quilt? The birds are Beautiful Birds by TRacy Lizotte for Elizabeth's Studio. The blue is a Shadow Play by Maywood Studios (sorry, don't know the exact shade). The green is also by Maywood, though I don't have more info than that from the selvedge. The floral is "Arbor Hill" for Benartex. Very pretty. I'm no help on quilting decisions... that is always what stalls my projects. Very pretty. You've probably already decided on a quilt motif. I was thinking some kind of leaf design. Or wouldn't it be cool to quilt a big motif of a big tree with lots of branches over the whole thing?